Systems modulating, transporting, and detecting lightwaves have evolved tremendously in the past four decades. The first systems, which were relying on intensity modulation with direct detection have little in common with those manufactured today. Not only have optical fibers and electro-optic components drastically improved, systems now employ digital signal processing for its agility and versatility, initially deployed for long-reach communication systems but slowly making its way into systems covering shorter distances. Due to several network transforming reasons, we are now observing needs for massive deployment of fiber-optic transceivers covering distances of only 10 to 100 km but delivering much faster throughputs than those offered by legacy systems targeting these distances while maintaining low cost and power consumption, small foot print and very-low latency. In this paper, we review the evolution of fiber-optic communication systems, from intensity modulation with direct detection to coherent transceivers and digital signal processing-assisted direct detection. We address the main impairments preventing large bitrate–reach products for systems relying on intensity modulation with direct detection. We present a few reasons leading to the recent surge of the short-reach transceiver market segment, especially transceivers covering distances between 10 to 100 km. 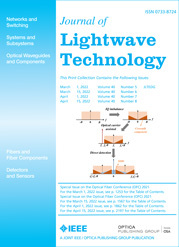 We summarize a few proposals for this market modulating and recovering an increasing number of degrees of freedom of the lightwave while maintaining self-beating direct detection. We conclude with remarks on the use of coherent technologies to address this market segment.